This thing has been with me for maybe three years. It’s never been enough to really knock me out. It didn’t derail me from my first marathon and subsequent 10-milers and half-marathons. However, several weeks ago I did a long trail run and it felt like a nail had been driven into my heel. I figured it was time to sort this out. The solution has been a mix of biomechanical and running technique adjustments, and a deeper understanding of pain science. Before I met with anyone I put a green Superfeet insert into my shoes. I’m a minimalist shoe advocate. I don’t want to rely on a crutch but I’m also very much willing to do whatever is appropriate to solve a problem. A lot of what I’ve read for addressing heel and Achilles problems suggests putting some sort of insert into a shoe. The idea here was to unload some of the muscles and structures that hold up the foot, including the Achilles. I’m still using the inserts on a lot of my runs but I rarely wear them at work and I do some of my runs with without the insert. I next met with a couple of guys with a lot of great knowledge and experience. Mike Terborg and Nick Studholme were both very instrumental in my progress. Mike is a performance and injury recovery specialist in Boulder and Nick runs Studholme Chiropractic. Mike is heavily influenced through John Hardy and the principles of FASTER Global which teaches a process of biomechanical reasoning. Nick studied under the innovative physical therapist Gary Gray. Both guys speak much the same language when it comes to movement and movement analysis. They both have tremendous ability to explain what they see and communicate the changes they thought I should make. They both used a fantastic and powerful video program called Spark Motion which was created by Nick and a group of other guys. This was just an amazing way to record and analyze movement. Spark is a great tool that I need to look into. “Adhering to the Biopsychosocial or BPS model of pain (vs the Postural-Structural-Biomechanical model), we couldn’t say for sure what was causing the pain other than it could be a combination of things including but not limited to biomechanics. 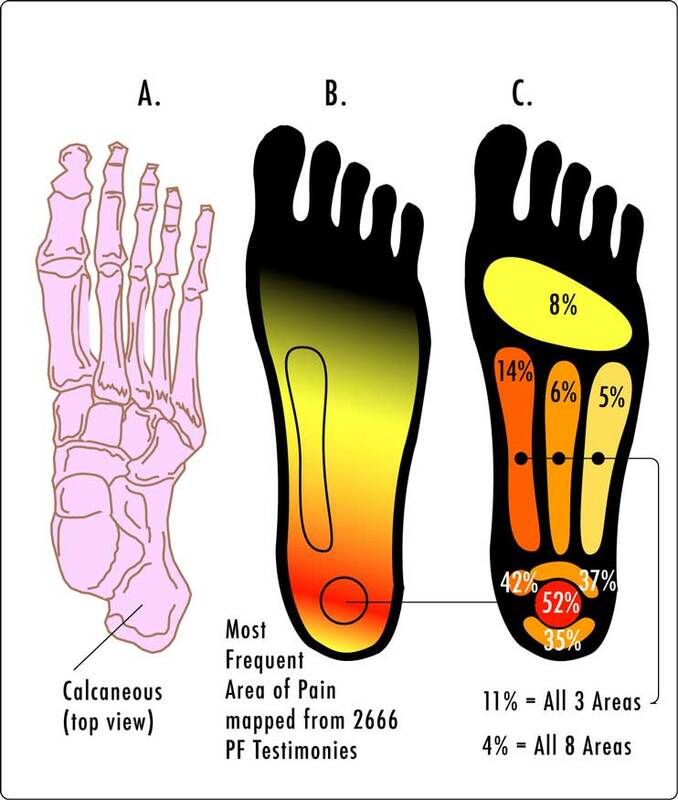 You had chronic pain of the plantar fascia, like to run, and wanted to be able to run more without aggravating this injury so we needed to look at your physiological skills and tendencies relative to gait. We cannot say for sure that eversion and dorsiflexion of the subtalar joint caused the injury (because these are natural motions of subtalar joint and thus normal motions for the PF to decelerate), but we can deduce that less loading of the plantar fascia (less dorsi/eversion) might be helpful in reducing the amount of stress on the PF during running. Our hope was that less stress/load during gait may allow you to run pain free for longer. In sum, we can say for sure that we crossed some type of stress threshold (bio, psycho and or social), so we wanted to ask your body what happened if we backed off on the biomechanical load to the pissed off tissue. I really like Mike’s explanation of the process. He puts his explanation in a very honest way. In saying that we don’t know for certain why the pain is there, nor do we understand exactly how or why it might go away, he reflects the current cutting edge of pain science which reveals that pain is in many ways a baffling mystery. Put less pressure through the heel into the ground. Let the heel touch the ground but only lightly. Quicken the stride so the foot stays in contact with the ground for less time. Swing the right leg through faster to facilitate less time on the ground of the left foot. Run with a metronome set somewhere between 170-190 bpm. This quickens the stride rate. Experiment. The resulting new gait felt like I was some sort of prancing fool–La la la la laaaa!! !–dancing through the daisies. Fortunately the video Mike shot of me indicated that in fact I just looked like I was running with a quicker step. (I could in fact go running in public this way.) Finally, Mike also suggested I visit with Nick so I did. Nick put me through a muscle testing process and winnowed out some weak and unstable muscles in my lower leg. Specifically, big toe muscles known as flexor hallucis longus, and flexor hallucis brevis weren’t working up to par. The fibularis muscles (aka peroneals) were also a bit off line. 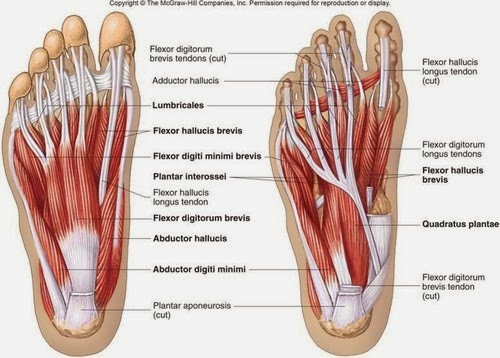 Taken together, when these muscles work they create and control plantar flexion and inversion of the foot as in the push-off of running or walking, and they create/control dorsiflexion and eversion of the foot as when the foot hits the ground. Of great importance is the ability to anchor the big toe to the ground while the body passes over the foot. I was missing the mark. Nick taped my foot in a way to help facilitate this anchoring and he showed me several exercises to help me feel, create and control better big toe function while running. These exercises were similar in nature to what Mike showed me. Some discomfort remained for a couple of weeks in a stubborn way. It wasn’t terrible but it was hanging around like it was ready to pounce. I was worried that there was something we might be missing. This last bit of hanging-around heel trouble would be gone within 48 hrs after I reviewed the current ideas on pain and the brain. I’ll discuss that in the next post. Physioblogger.com is a fantastic blog with all sorts of detailed and concise information on movement, injury rehab and all such things. I actually cannot figure out the name of the person who puts it together but whoever he or she is, they’ve done a great job. 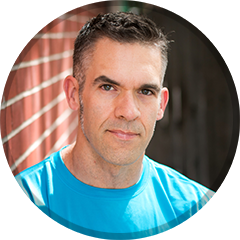 The Physioblogger holds degrees in both sports science and physiotherapy. He or she is the Director of Functional therapy for FASTER, and holds certifications from FASTER and Gary Gray’s Gray Institute. Look here for a full list of credentials. His or her methods and writings are clearly highly influenced by Gray’s work and the work from FASTER which is to some degree an offshoot of the Gary Gray’s work. I found the site because I’ve been battling on and off bouts of something like plantar fasciits and/or Achilles tendon trouble. (I’ve mentioned this stuff in prior posts but my site was hacked and those posts aren’t available right now.) Physioblogger’s series on plantar fasciitis starts with Understanding the Root Cause of Plantar Fasciitis. It follows with Plantar Fasciitis: Treatment Strategies – Part I and Part II. The treatment strategies are very comprehensive, covering everything from the toes to the ankles, hips, thoracic spine. Two other articles (Mid-Tarsal Joint Treatment Strategies and 5 Ways to Increase Dorsiflexion) are interesting and may prove helpful in addressing plantar fasciitis. There’s a lot to look through here and I’m just started. Some of the strategies are beyond my skill set as I’m not a manual therapist. But, I’m getting a lot of good ideas along the way. This is a quick update to my recent plantar fasciitis posts (Part I and Part II.) I met recently with Denver-area Z-Health movement specialist Brain Copeland and it seems he may have helped me find a titanic breakthrough in my PF! Briefly, he assessed whether or not my arms and legs were coordinated properly during gait. He used muscle testing as part of this assessment. Turns out I had really only been cheating at walking and chewing gum. My gait looked normal enough but I was weak in certain positions where I should’ve been strong, and I was strong in some positions where I should’ve been weak. He then introduced cross-crawl patterns to me. Since then, my PF pain has decreased significantly and it has stayed that way. (I saw him on Saturday and this is Wednesday.) In some circles, this is known as a “WTF?” moment. Goofy? Yes. Effective? Also yes! Cross-crawl patterns are, as the name implies, movement patterns that resemble crawling. That is, the right arm and left leg converge and vice versa for the left arm and right leg. These are remarkably easy patterns and they can be created while standing, seated, prone or supine. Some of this stuff resembles some goofy old-school “aerobics” class movements (‘Knee to elbow everyone! !”) The supine cross-crawl looks like the “dead bug” ab exercise while the prone cross-crawl is essentially the same as the “bird-dog” low-back rehab exercise. Still another version looks like some sort of Irish jig. Fun stuff right?! (The good news is these moves are really easy and at least in my case, very powerful.) I’ll post video of cross-crawls soon. Q: Who might benefit from cross-crawl patterns? Q: How do we identify those who may have this neurological switching? Q: What do cross-crawls achieve? Can you describe what these patterns do for our brains? Q: What else should we know about cross-crawl patterns? Further information on cross-crawl patterns can be found at the following sites: Head Back to Health, Natural Health Techniques. Part I of this post ended mid-way through my explanation of various strategies to combat plantar fasciitis (PF). Here are more treatment methods. Various taping strategies may be used to help alleviate PF symptoms. Tape should help support the arch of the foot and help shoulder some of the burden borne by the plantar fascia. There are two options. First is the traditional white athletic tape. This stuff can be rigid and uncomfortable but possibly effective. Here’s a video on how to apply athletic tape in order to relieve PF. And here is a slightly different method. The other taping option is elastic therapeutic tape, (aka Kinesio tape.) Elastic therapeutic tape became popular during the 2008 Beijing Olympics where many athletes were seen wearing the strange, multi-colored blotchy looking stuff on their legs, shoulders and other body parts. Kinesio tape supposedly goes beyond simply providing support to injured areas but also may influence the healing process. Here’s resource on how to apply this stuff. For anyone interested in a more medieval approach to PF, you may enjoy the night splint. Similar to the night splint is this specialized sock. Both items are designed to provide a prolonged stretch to the plantar fascia and Achilles tendon while you sleep. I recently spoke to an employee at a local running shoe store and she said these things are fairly uncomfortable. Still, several posts I’ve read on various forums proclaim these things as useful. This guy swears by walking on gravel in his sock feet. I think it must be the same principle as using a golf ball to break up the scar tissue associated with PF. Other sources suggest freezing a can of coke and rolling it underneath the foot. Here’s an example of a specific plantar fascia stretch from which some folks have had success. I would suggest staying away from cortisone injections. Cortisone is a powerful steroid that can provide very quick relief from PF pain. The big drawbacks are 1) it’s a symptom treatment; it doesn’t fix anything, and 2) too much cortisone weakens connective tissue thus creating a risk of a rupture. Nor can I see much benefit to plantar fascia release surgery. This again doesn’t solve a problem but may create more problems. Part of this surgery includes cutting the plantar fascia in order to release tension. Problem is the plantar fascia is a major shock absorbing part of the body. Altering that structure doesn’t seem wise to me. As I’ve thought about my own PF, I realize a couple of things: 1) I changed my gait and therefore changed how my tissues were being stressed. 2) I simply didn’t give myself enough time to adapt to this change. 3) I believe my PF is part of a larger puzzle involving faulty movement patterns. Here’s my plan. The one common theme I’ve seen and heard from those who’ve overcome PF is that rest is necessary. Damaged tissues must be allowed to heal. Therefore, I’ve greatly reduced my running and biking. There seems to be no way around it. If, as I believe, I have faulty biomechanics (i.e. I don’t move well) then no matter how much I rest and treat my injury, I can expect it and/or other similar symptoms to return once I start running again. Thus I must search out those resources that will help correct my movement problems. Z-Health is my chosen rehab system. Why Z-Health? Because the Z-Health methodology recognizes that there is probably more to my PF than simply heel pain. My whole body–especially my nervous system–must be addressed in order to move better. Z-Health has helped tremendously with my back and shoulder pain, and I’ve seen numerous others improve their performance through Z-Health. I’m a certified Z-Health trainer but I recognize that I can’t solve all my problems on my own. Twice recently I’ve visited with certified Z-Health practitioner Brian Copeland of Core Fitness in Aurora, CO. I’ve been very impressed with my results thus far–especially after yesterday. We did further testing on my neurological system and found that certain fundamental aspects of my movement coordination aren’t functioning quite correctly. Among several exercises, we recently implemented cross-crawl patterns into my process. All I can say is I’m stunned at how much better my heel feels! In 24 hours the pain has subsided very significantly. I believe correcting my movement patterns is the most significant and most complex part of my plan. I haven’t experimented much with massage though I’m aware of its role in many athletes’ lives. Structural integration (Rolfing is a type of SI) involves manipulating connective tissue including the fascia. In this way, my body should interact better with gravity. Posture should improve, pain should diminish and I should move better. Donielle Saxton is the Denver-area massage therapist with whom I’ll be working. The details and principles behind this process is really fascinating. For further information check out Anatomy Trains and KMI (Kinesis Myofascial Integration). Finally, I’m getting a bit of cold laser therapy at Mederi Health in Denver. This is pure symptom treatment–and I’m OK with that. Reducing the pain should help calm my nervous system and speed my return to normal function. I recognize that my arch may need some help. Therefore I’m going to bolster the area by way of a grocery store-bought arch support and Kinesio tape.